EDGEWOOD — Three ardent anglers are anxiously awaiting a chance to use a 75 year-old fishing lure found in a partition of a house being remodeled. 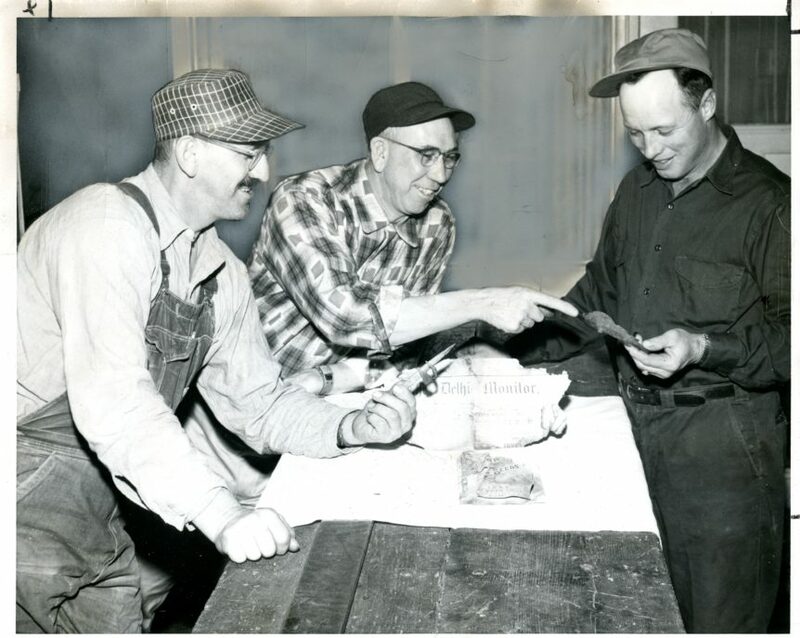 Earl W. Gleason, Edgewood builder, and Bert Schultz, Edgewood electrician, (L to R) found the lure in a partition in the house on the Paul Funk farm near here. Also found in the partition was a corn husking peg, an 1881 newspaper and an 1883 seed catalog. Gleason, Schultz, and Funk are anxious to find out how the old fish lure will work. The lure is of hand-carved wood about eight inches in length. It has a small insert in the bottom of the plug to make it run deep when trolled. The fins and tail are made of copper. The upper fin is perforated, the tiny holes evidently having been designed to be used as a depth control. The husking peg is also handmade. Of small size, it apparently was intended for use by a child or a woman. The seed catalog is a lot like its modern sequel. It promises the biggest and best of all types of seeds and flowers. The one glaring difference is the lack of color in the older version. The newspaper is addressed to H. Adams. Paul Funk says his father, J. P. Funk, purchased the farm in 1906. Paul, who was born on the farm, is the present owner. His mother makes her home with him. None of the three men—Funk, Gleason, or Schultz — indicated any eagerness to try out the husking peg.